With this being the 9th consecutive year of Art Elliott’s Mayhem, we want to honor his long and influential life by updating the tournament name to “The Art Elliott Memorial”. Amateur players will receive an ALWAYS awesome Top of Texas players pack, and the pro players have $750+ added cash and a history of a solid pro field to battle it out against. 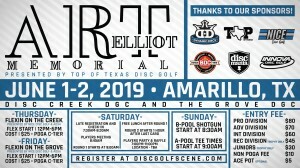 Get registered online, and come out to celebrate the life of our good friend, Art Elliott! Nice Disc Golf and ADGA will be hosting flex start C-tier tournaments on both Thursday and Friday, details are listed on the flyer. This year’s Memorial will be the same format as last year’s Mayhem. We will be playing both Disc Creek and The Grove. There will be 2 rounds on Saturday, both shotgun starts, with free lunch provided between events. On Sunday, B-pool will play Disc Creek with a shotgun start at 8:30, and A-pool will play The Grove, with tee times beginning at 9:00. Saturday night will feature a players party and raffle, location TBA. Tournament shirts are not included in this year’s amateur players pack, but ARE available for sale at the online registration page. 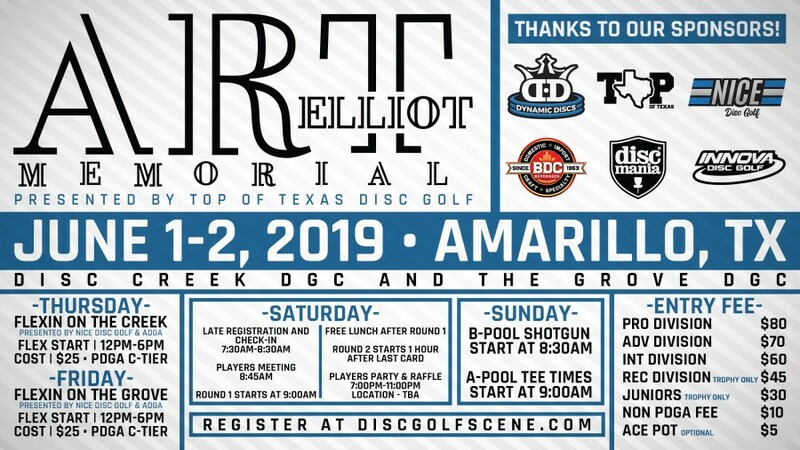 Top of Texas Disc Golf is responsible for all refunds/cancelations. - 6:00pm “Flexin on the Creek” hosted by NICE Disc Golf and ADGA. Flex start C-tier from 12-6, $25 entry for all divisions. Also will be accepting registration and check in for the Memorial. - 6:00pm “Flexing on the Grove” hosted by NICE Disc Golf and ADGA. Flex start C-tier from 12-6, $25 entry for all divisions. Also will be accepting registration and check in for the Memorial. - 8:00am TD Central (The Grove)- Player check in, and late registration if available- Come check in, get your caddy book (pros and ams) and players' pack (ams only)! - 12:30pm Round 1 A POOL Shotgun Start- time is estimated. A POOL is playing The Grove long pads (north course). - 12:30pm Round 1 B POOL Shotgun Start- time is estimated. B POOL is playing Disc Creek short pads (south course). - 2:15pm TD Central (The Grove)- time is estimated. Players' Meeting for B POOL Round 2. - 2:30pm TD Central (The Grove)- time is estimated. Players' Meeting for A POOL Round 2. - 6:00pm Round 2 B POOL Shotgun Start- time is estimated. B POOL is playing The Grove short pads (north course). - 6:00pm Round 2 A POOL Shotgun Start- time is estimated. A POOL is playing Disc Creek long pads (south course). - 11:55pm Players' Party- time is estimated. Location TBA. Raffle at players' party- 100% of profits go to pads for The Grove. - 11:30am B Pool playing Round 3 at Disc Creek short pads- Shotgun Start at 8:30am (NO PLAYERS' MEETING). Cards available at TD Central (The Grove) at 7:30am. - 1:30pm TD Central (The Grove)- estimated time- FREE LUNCH, and B Pool amateur vouchers available to redeem for top 45% of each division. - 3:00pm TD Central (The Grove)- estimated time- Award Ceremony! Both A and B Pool amateur vouchers available to redeem for top 45% of each division. Pro awards available to redeem for top 40% of each division by check or paypal.